Cathaygems.com and Orientalpearls.net are divisions of C.D. Plus, Inc., a company incorporated in San Diego, California and a provider of freshwater pearls and pearl jewelry for years. We wholesale pearl jewelry and pearls and provide customized pearl jewelry for both wholesale and retail customers. Our standing with the Better Business Bureau is proof! Cathaygems caters more to retail customers and offers quantity discounts and also free shipping to those puchasing multiples of the same items. 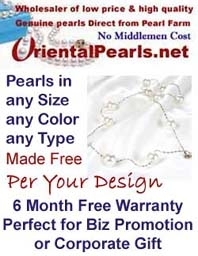 Orientalpearls.net caters more to the wholesale community and offers strands for designers and artists at bottom line pricing. Both online stores offer prices never seen before in the industry. With our convenient websites, we offer an affordable and leisurely way to shop for the world’s finest quality cultured pearls with no overhead and no pressure from salespeople. Brides love our impressive selection of jewelry and sets for that classic and finished look that pearls add on their big day. Pearls are the perfect accent for flower girls and the bridal party through the generations and all the way to the grandmothers celebrating this special day. Because we are a true pearl farm-to-consumer supplier of pearls and pearl jewelry, we can offer the highest quality premium pearls. You pay no middleman's profit – that’s how we keep our prices low. All purchases come with a Certificate of Authenticity so consumers can trust they are purchasing the real thing. We obtain cultured pearls directly from pearl farmers, immediately after they are harvested. After being sorted by size, shape, color, and luster, our jewelry crafters then create the most exquisite pieces possible. We are a member of the Shanghai Gem and Jade Association, the prestigious professional jewelry organization in the People’s Republic of China. · A Low Price Guarantee with 100% Price Protection and 10% Match.